What the heck is that, anyway? 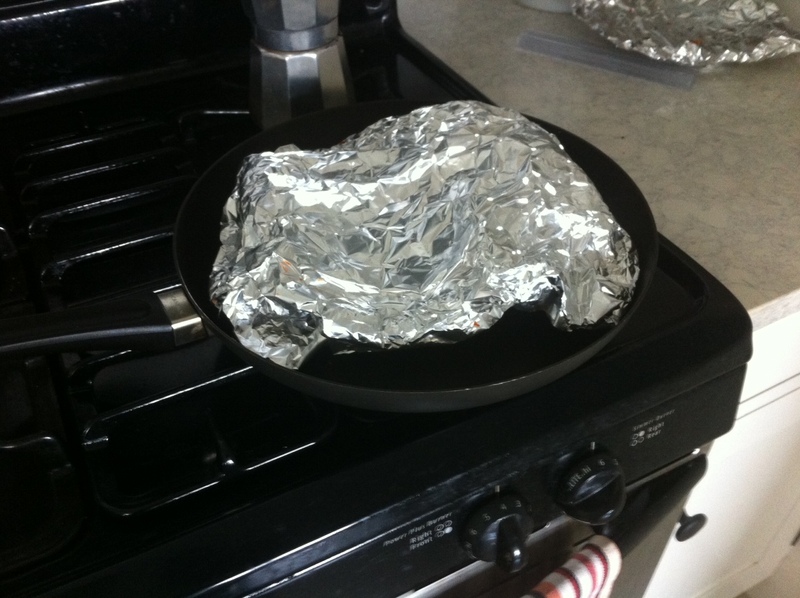 Looks like a blob of tinfoil… . Every now and again you come across something so game-changing that life can be categorized as “before” and “after” the event, so large does it loom in the psyche, so consequential is it. Typically those events are either great tragedies (all too easily imaginable, I fear) or great joys, such as a wedding or birth of a child. Props where they are due: Thanks to Lifehacker.com for posting this initially, and of course the originator of the below video, Chef John of FoodWishes.com. I’ve since tried it and can tell you it is a major game changer, and wish I knew about it 30 years ago or more. If only I’d always known of it, all of my reheated pizza ever would’ve been insanely more delicious. Now understand this has nothing to do with the perfect joy that is cold pizza. I would never argue against a slice of cold pizza, if that’s your preference (as it is mine on occasion). But if you like reheated pizza, chances are, like me, you’ve been doing it wrong your whole life. Chances are you’ve been sticking it into the toaster oven or microwave. Of these, the toaster is the preferable method, as the microwave tends to land you with a mushy slab of, well, something. At least in the toaster oven there’s a chance at getting something resembling the beloved pizza you ordered. Now what if I told you there’s a way to get not just the beloved pizza you ordered back, but a reasonable chance it will be better than when you got it in the first place? You’d be incredulous, right? Don’t be. 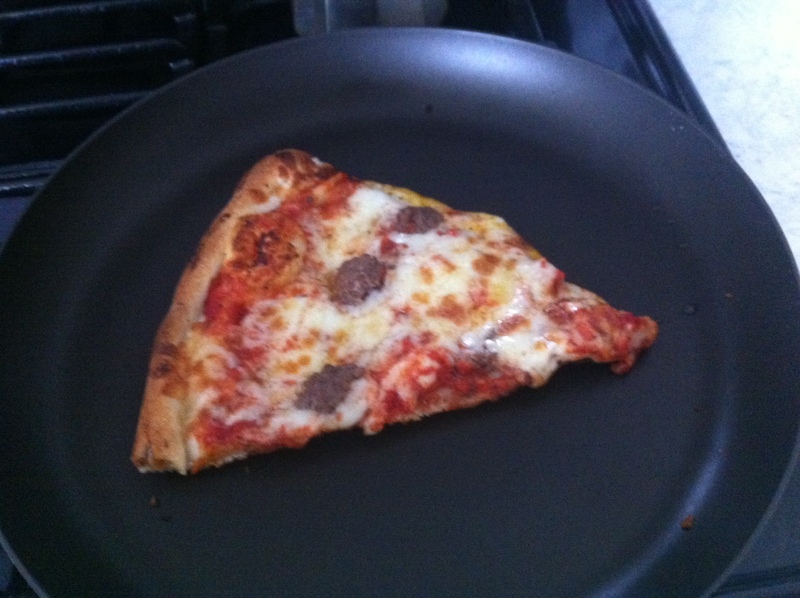 The best way on Earth to reheat a pizza is in a pan, on your stove. Take a look at this remarkable video which explains the method. My own experiment is below. Seems crazy, doesn’t it? Well I tried it, and it works beautifully. Beautifully. 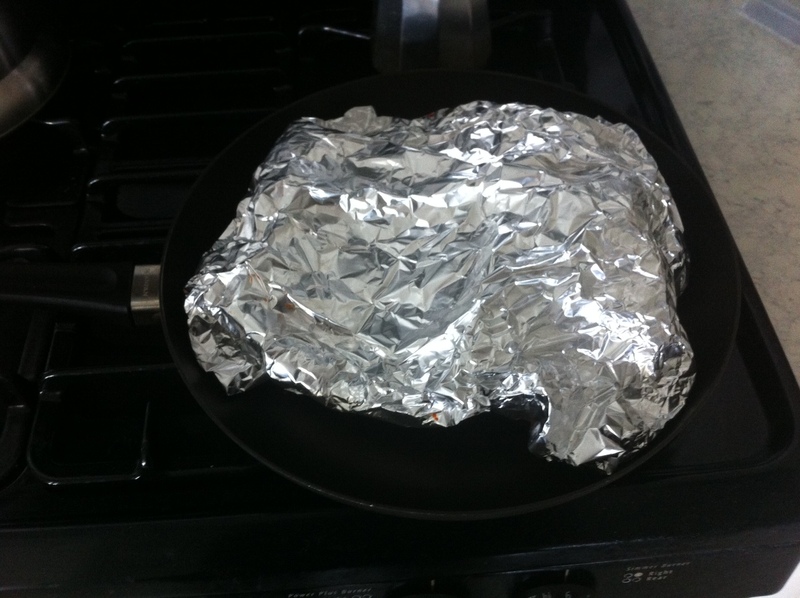 Beneath the loose dome of foil is a slice of pizza. Simply take the slice of pizza, slide it into a pan, place the pan over medium heat, and cover the pizza with a little tinfoil dome. Then wait. For my first slice, the pan was cold, so the process took about 8-10 minutes overall. For my second slice, the pan was nice and hot, and the slice cooked up in 4-5 minutes (in fact while I was happily eating the first slice). Important: You do not need to add any oil or other similar substance to the pan at all. I used a nonstick pan and there was – as indicated in the video – plenty of grease lingering in the pizza to handle everything. You simply wait a bit and by the time your cheese is nice, hot and mekty, the crust will be incredibly, delectably crispy and crunchy. Well if I can’t win you over with my words and your eyes, perhaps you’d care to trust your ears. Just listen to the crispy happy as I fold this delightfully reheated bit of wonderful (courtesy, by the way, of the delightful V&T Pizzeria, the only mushy pizza in New York City I love). Do you hear that? Unlike the first video, I spared you the sound of the om nom nom that followed, but believe me, it was spectacular. Now you know the best way to reheat pizza at home.